Congratulations to our students, who made the Malaysian Book of Records for "The Biggest National Logo Made of Recyclable Materials". The other week I left the staff room, when I saw a bunch of form 1 and form 2 students dipping donut shaped pieces of paper in blue paint. Meor, one of the students from 2Z, had so much blue paint all over him, that he looked like an extra from "Braveheart". When I asked Meor and the other students what they were doing, they weren't able to tell me anything, other than they were making a flag or something. Then it started to rain, and they started throwing the blue paper rings on the porch of the engineering building. 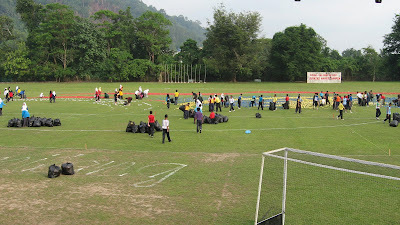 A couple of days ago I left the office, and the lower form students were on the field with plastic bags filled with red white and blue rings. Encik Khairuddin was on the loudspeaker in the reviewing stand, shouting instructions. Then it became clear what they were making- a national logo out of newspaper and cardboard for the 50th Merdeka, the 50th anniversary of Malaysian Independence. Today, the students made the logo for some VIP from the education department who was retiring. They got a certificate from the Malaysian Book of Records honoring their achievement. They deserve it, if for nothing else than having to sit out in the hot sun for a couple of hours having to listen to a bunch of insipid "Inspirational Speeches". More like aural torture, I'd say. Well anyway, congratulations kids! Both for the record, and enduring the sweltering heat and all the dramatically boring speeches.